Allen Leech (born 18 May 1981) is an Irish actor best known for his role as Tom Branson on the historical drama series Downton Abbey. He made his professional acting debut with a small part in a 1998 production of A Streetcar Named Desire, made his first major film appearance as Vincent Cusack in Cowboys & Angels, and earned an Irish Film & Television Awards nomination in 2004 with his performance as Mo Chara in Man About Dog. Leech played Marcus Agrippa on the HBO historical drama series Rome. He also played Paul Prenter in the 2018 biopic Bohemian Rhapsody. Leech was born in Killiney, County Dublin, to David Leech, the CEO of a computer systems company, and Kay Leech, a housewife. He is the third of four children; he has an older brother, Greg, an older sister, Ali, and a younger brother, Simon. He attended St Michael's College. Leech became interested in acting at 11 when he was given the part of the Cowardly Lion in a school production of The Wizard of Oz and found he loved being on stage. He recalled how he immediately decided to become an actor when Peter McDonald told him how acting is a profession on the last night of the production's run. Afterwards, drama became the "focal point" of Leech's teenage years, apart from his family life, and drama and family support helped him through his school years. He became set on acting after winning a small role in a 1998 production of A Streetcar Named Desire at the Gate Theatre. He earned a Bachelor of Arts and a Master's Degree in Drama and Theatre Studies from Trinity College, Dublin, later noting this was a "loophole" in his parents' stipulation that he earn a degree to fall back on if he failed to have success as an actor. He landed his first major roles in Cowboys & Angels and Man About Dog while at Trinity, and he has admitted that he did little schoolwork because he spent his time on auditions and acting. Leech's first professional stage role was in 1998 at the Gate in their production of A Streetcar Named Desire. "I was the gentleman caller to Frances McDormand's Blanche Dubois. The Coen brothers were walking backstage, and me a naive 16-year-old." He appeared as Willi in the Queen and Peacock, at the Garter Lane Arts Centre. The following years, Leech was in Tom Murphy's The Morning After Optimism and then Hugh Leonard's Da at the Abbey. Leech's breakthrough film performance was in Cowboys and Angels, in which he played Vincent, a gay fashion student, followed by a role in the 2004 cross-country caper film Man About Dog. Leech played the role of Shane Kirwan in the Ireland's RTÉ series Love Is the Drug, in which he received a Best Actor nomination from the Irish Film and Television Awards. He followed that up with the role of Willy in the television series Legend, which is the story of three different Irish families. He received a Best Supporting Actor nomination from Irish Film and Television Awards for his performance. In 2007, Leech appeared in the HBO drama series Rome as Marcus Agrippa, Octavian's top soldier and friend. The film, Rewind, opened in Ireland on 25 March 2011. In 2010, he appeared on the small screen in The Tudors as the doomed Francis Dereham, former lover of Catherine Howard. Leech also appeared in ITV 2010s television series Downton Abbey as chauffeur Tom Branson, whose political ideologies clash with the upper class. He played the role of officer Sam Leonard in television series Primeval in 2011 in series five. Leech also starred in the 2012 film adaptation The Sweeney. Leech was voted sexiest Irish male in 2005 in U Magazine. He was named one of GQ's 50 best dressed men in Britain in 2015. Leech played Freddie Mercury's personal manager and boyfriend Paul Prenter in the biopic Bohemian Rhapsody (2018). Which earned him a nomination for Outstanding Performance by a Cast in a Motion Picture at the 25th Screen Actors Guild Awards. In February 2018, Leech announced his engagement to actress Jessica Blair Herman. They were married on 5 January 2019 in Solvang, California. 2004 Battlefield Britain Episode: "A Clash of Kings: The Battle of the Boyne"
2008 Heroes and Villains Edeco Episode: "Attila the Hun"
2011 Black Mirror Pike Episode: "The National Anthem"
^ a b MacDonald, Marianne (22 July 2007). "Rome Sweet Rome". The Evening Standard – via Infotrac (subscription required). Retrieved 12 November 2012. ^ a b c Randall, Lee (15 September 2012). "Interview: Allen Leech on the return of Downton Abbey". The Scotsman. Retrieved 10 November 2012. ^ Butler, Laura (3 November 2012). "'Downton' star Allen loves his role as rebellious Irishman". Irish Independent. Retrieved 10 November 2012. ^ "Downton Abbey star Allen Leech denies being bullied as a child". The Sydney Morning Herald. 17 February 2014. Retrieved 25 February 2014. ^ a b Nolan, Emma (3 September 2006). "A cowboy and an angel wrapped up to make a legend". Irish Independent. Retrieved 10 November 2012. ^ "Allen Leech". Troika Talent. Retrieved 10 November 2012. ^ "Allen Leech on the Thursday Interview". The Right Hook. Dublin, Ireland. 1 November 2012. Newstalk. Archived from the original on 3 June 2013. ^ "Allen Leech". Biography in Context. 28 February 2015. Archived from the original on 28 February 2015. Retrieved 10 December 2018. ^ Jamie Russell: "Man About Dog" (2004), BBC.co.uk, 14 November 2004. ^ Wallace, Arminta (9 December 2018). "Living legends". The Irish Times. Retrieved 9 December 2018. ^ "HBO". Retrieved 5 January 2015. ^ "Welcome to Twitter - Login or Sign up". Retrieved 5 January 2015. ^ Busch, Anita (August 30, 2017). "Allen Leech Joins 'Bohemian Rhapsody' As Paul Prenter, Freddy Mercury's Judas". Deadline. Retrieved August 30, 2017. ^ Nordyke, Kimberly (December 12, 2018). "SAG Awards: Full List of Nominations". The Hollywood Reporter. Retrieved December 12, 2018. ^ "Allen Leech on Instagram". Instagram. 14 February 2018. Retrieved 14 February 2018. ^ Martin, Annie (16 February 2018). "Downton Abbey alum Allen Leech engaged to actress". UPI. Retrieved 14 December 2018. ^ Shahid, Sharnaz (15 January 2019). "Exclusive: Downton Abbey's Allen Leech surrounded by co-stars on wedding day". Hello!. Retrieved 21 January 2019. 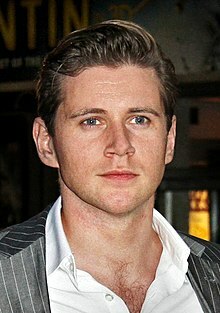 Wikimedia Commons has media related to Allen Leech.